Against the backdrop of heightened tensions with the Chinese authorities over the church's prerogatives on the Mainland, late last month saw an especially pointed Vatican response as the Pope named a Hong Kong-born priest as second-in-command of the Roman office overseeing the Catholic world's vast mission territories, making him the highest-ranking Chinese ever tapped to enter the church's own Forbidden City. Just on its own, the unique mix of historic and geopolitical threads is enough to make the rise of Archbishop-elect Savio Hon Tai-Fai a significant news-moment. The 60 year-old theologian's profession in the Salesians of Don Bosco -- the community of Benedict's powerful "Vice-Pope" Cardinal Tarcisio Bertone... and, not coincidentally, no shortage of this pontificate's other top appointees -- adds more still to the nod's prominence, as does the longstanding custom that most of Hon's predecessors as #2 at what's now known (at least, officially) as the Congregation for the Evangelization of Peoples have gone on to become cardinals. Now, however, word's emerged that the unprecedented move will be capped with an even higher-octane dose of the "papal treatment" -- one that, given the roots of the Sino-Vatican clash (read: the ordination of bishops without papal mandate), is conspicuously rich in irony. Archbishop-elect Hon said recently that he has felt “pressure every day” since the announcement. “I’m reluctant to leave my hometown and take the Vatican post, but I will devote every effort to follow God’s will,” he said. He admitted that his teacher and confrere Cardinal Joseph Zen Ze-kiun’s deep insight and sense of justice had inspired him. “We should respect the underground Catholics who have been loyal to their faith and understand the value of their existence,” he said. On guarding Church principles such as bishop ordination without papal approval, “I am a hardliner,” he said. After his ordination, Archbishop-elect Hon will return to Hong Kong for celebrations on Feb. 19 and 20. “I hope to share the joy also with the mainland Catholics,” he noted. 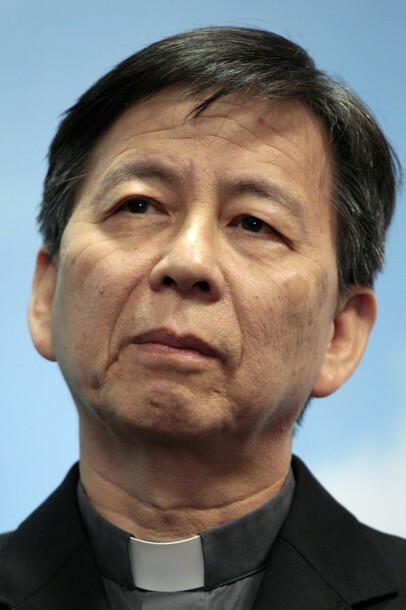 The archbishop-elect was invited to teach at mainland seminaries and give spiritual guidance to students occasionally from early 1990s to 2003. In recent years, he occasionally gave lectures for mainland priests. Alongside the new deputy to the reigning "Red Pope," the Propaganda prefect Indian Cardinal Ivan Dias, the Pope will ordain two freshly-named Apostolic Nuncios without portfolio assigned to the direct service of the Secretariat of State, and the new archbishop-secretaries of the Congregations for the Clergy and the Causes of Saints, both of whom previously served in their respective dicastery's third-ranking posts. Counting the three new secretaries, the Pope has named the seconds-in-command of seven of the nine Congregations -- the foremost Curial offices, which hold executive authority over the church's internal life -- within the last 18 months. Since his 2005 election, B16 has named eight of the dicasteries' nine prefects; the lone remnant of John Paul II's senior Curia is the Catholic Education chief, Cardinal Zenon Grocholewski, who's held the post overseeing the church's network of universities and seminaries since 1999. While the Polish Pope made an annual practice of ordaining newly-named Nuncios and senior officials as bishops on the feast of the Epiphany over his 27-year reign, Benedict's appointees to the church's central government are customarily invested by Bertone at several points through the year. To date, the pontiff has served as principal consecrator at ordinations in 2007 and 2009. Each likewise saw the elevation of several new prelates, but like Hon this time around, featured one key figure whose presence among the group moved Benedict to reserve the rites to himself.